The 1K17 “Szhatiye” project which went into service in 1992. Source: Scientific production association "Astrophysics"
It has been a busy fall season in the world of military laser warfare. In September, Boeing unveiled its truck-mounted 10-kilowatt High Energy Laser Mobile Demonstrator, capable of knocking out drones and even missiles. In November, the commander of the Fifth Fleet of the U.S. Navy, Vice Admiral John Miller, confirmed receipt of the first combat laser and its installation on the amphibious assault ship USS Ponce. China also announced the development of a laser that can shoot down small aerial targets. And while little is revealed publicly, Russia has not let its laser development program idle either. Laser warfare: Sci-fi fantasy or future reality? At the current stage of development, rocket technology is still far superior to existing laser weapon capacity. But the quest to harness laser power is also about the cost of a single shot. All missile technology is costly, but when used over long distances this requires additional navigation systems, a large fuel load and other line items that drive up the cost of a single strike. The attraction of lasers remains their simple power to effect ratio: Firing one costs as much as generating the power it consumes. This was also a guiding principle when the Soviet Union powered up its laser program in the 1960s at the top-secret "Astrophysics" scientific research and production center. Appointed to head it in 1978 was the talented physicist Nikolai Ustinov, son of the powerful Soviet Defense Minister Dmitry Ustinov. The SLK 1K11 “Stiletto”. Source: Scientific production association "Astrophysics"
Laser guidance systems had now been developed in anti-missile laser systems. The SLK 1K11 “Stiletto” uses radar to detect a target, probes it with a laser to detect any lens gleam and hits the spot with a powerful laser impulse. The system was fitted with a mobile power supply and installed on the chassis of a tracked mine-laying vehicle. The Stiletto was delivered to the Red Army in this form in 1982 but was still classed as experimental. While only two units were ever produced, it is formally still in service with the Russian Army. “Sanguine” was a modern variant that eschewed bulky mirrors and could be fired vertically. Source: Scientific production association "Astrophysics"
The year after Stiletto became suitable for service, Astrophysics began work on a more advanced device that was originally conceived for air defense, a laser equivalent of the Shilka self-propelled anti-aircraft system. Unlike the Stiletto, “Sanguine” was a modern variant that eschewed bulky mirrors and could be fired vertically. 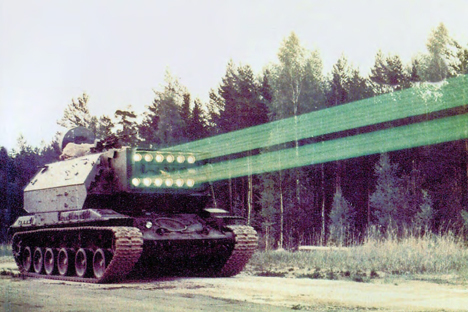 A laser cannon mounted on the Shilka platform could disable a helicopter’s optical system at a range of 6 miles and disable it entirely at 5 miles. The “Aquilon” system. Source: Scientific production association "Astrophysics"
Since unmanned aerial vehicles, or drones, did not yet exist, the “Aquilon” system was then developed for the navy on the basis of the Sanguine, with the task of knocking out electro-optical systems used by coast guard units. But the pinnacle of Soviet physicists’ laser research was the 1K17 “Szhatiye” project which went into service in 1992. While resembling the "Buratino" (“Pinocchio”) salvo-firing rocket and heavy flamethrower systems, Szhatiye’s 12 barrels did not hold rockets but multi-line lasers. Each had its own frequency band and internal guidance system, which were impervious to enemy filter systems. The weapon comprised a solid-state laser with fluorescent energizing lights similar to those of the American ZEUS remote demining system. Because of its powerful generator and power plant, Szhatiye was mounted on the chassis of the heavy Msta-S self-propelled gun. The system is still classified and there is no open data on characteristics like the range, firing rate or number of simultaneously engaged targets. Its range may be presumed to be no less than Sanguine’s, so twice the effective range of a modern tank. But while impressive on the drawing board, this must be set against the laser’s main disadvantage: the need for a clear line of sight in order to hit a target. Shooting at point-blank range in combat conditions is also hampered by terrain relief, rendering such systems largely impractical. But as evidenced by U.S. and Chinese activity, the use of lasers against guided missiles, helicopters and UAV drones (where using conventional missiles is prohibitively expensive), is a strong incentive for further development. The KDHR-1H “Dal” chemical detection and monitoring system. Source: Scientific production association "Astrophysics"
The collapse of the Soviet Union slammed the brakes on science and technology development in Russia for several years. Many items ended up as exhibits, including units built by Astrophysics, and examples are still surfacing unexpectedly. While the first Stiletto built probably saw some use, a second without laser sighting was found by enthusiasts in a factory in the Ukrainian city of Kharkov in 2010. The fate of Sanguin and Aquilon is not known, but at least one Szhatiye system made it into the public eye, now displayed in a museum in Ivanovskoye near Moscow. After detecting a toxic cloud, Dal calculates its coordinates and linear dimensions. The system’s automatic operating time without refueling is 130 hours, and three hours after a 500km drive. A unique piece of equipment when it was first introduced in 1988, Distance remains in service with the Russian Army.